So the story of the $150 shoes comes to an end. Kind of anticlimactic, too. Remember earlier this month when I went to Tysons and got those New Balance shoes? Those shoes are now back at the store in Tysons, and I got a refund. So after all of that buildup, and considering I did what my podiatrist told me to do, testing them in the store for ten minutes before buying, why did I never wear them, and ultimately return them? Well, it’s twofold. First, those shoes cost $150. A hundred and fifty dollars. 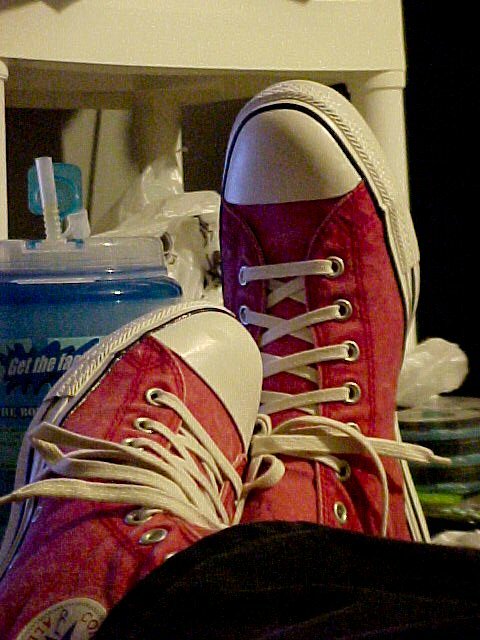 As I mentioned in the Journal entry linked above, that was more than I’ve ever paid for shoes by more than fifty bucks. That alone made me uncomfortable about wearing them. The fact that they were $150 shoes made me afraid to wear them. So there’s that. Then secondly, and more importantly, I don’t think now is a good time to buy nice shoes. I have now lost almost 100 pounds since I began this journey a year ago (99 pounds lost as determined at a weigh-in this morning!). In that time, my feet have changed size. Shoes that fit me last year don’t fit so well anymore. I wore flip flops that I wore last summer to the pool recently, and they were too big on me. Likewise, Crocs that I bought during heavier days are now so loose on me to the point that they’re almost unusable. The lined Crocs that I have are also too big for me now, and I only bought those in December. So since I’m not at a stable size right now, it made me even less comfortable with having shoes that cost that much, since my fear was that I would size out of them before getting my money’s worth out of them. It’s happened to me several times already with jeans. First I sized down out of my original jeans, then the jeans I got in August, and now it’s starting to happen again with the jeans I’m currently wearing. Thankfully, though, next time I have to replace the jeans should put me into cheaper sizes – and out of the big and tall store. This weekend was certainly a blast. 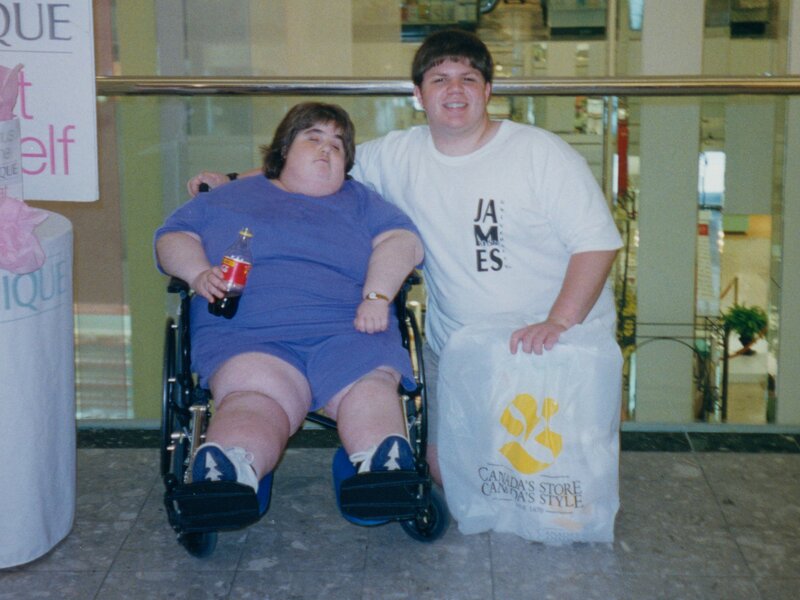 My mother came to visit, and we went to Tysons Corner on Saturday. The plan was for Mom and I to meet at Vienna. It made sense, since she was coming from Virginia, Tysons is in Virginia, and I could take Metro to meet her, thus only have to take one car out. And Vienna is somewhere that all of us were familiar with from countless visits to the DC area before I moved up here. So my plan was to take the bus to Glenmont and then Metro the rest of the way. First thing I learned was that Nextbus, while useful for the most part, is still very much not perfect. I left the house based on a prediction of a Y8 in 12 minutes, and so I headed down to the corner. It does not take 12 minutes to get down to the corner, but when I got there, there was no bus, and the bus that I was tracking had dropped off the screen, with the next bus not supposed to show up for 45 minutes, which would make me very late. So I ended up walking to Glenmont, because I knew I could walk there in less time than it would take to wait for the bus. I had never walked to the Metro from my house before. I had done from Metro to home many times, but never the reverse. The uphill walk was very good for working the calves, since my legs were sore by the time I got to Glenmont. I might have to do that more often. It was a good workout, and helpful on a week where I had missed a pool session. Once I got to the Metro, I got a seat on a train, and all was well. Mom, however, for reasons that neither one of us can quite figure out, got turned around a bit, and so my lateness ended up working out for her. I don’t know if she missed a sign for Vienna or what, but she managed to get lost. No idea how. And it’s frustrating when she’s lost in an area that I’m not entirely familiar with myself. Usually, I can guide someone over the phone to get wherever they need to, but I’m not that familiar with the neighborhood around Vienna station. I know how to reach the station from both sides of I-66, I know how to get to Route 123 from Vienna via Nutley Street, and I know how to reach the shopping center with the Safeway and Micro Center in it, and I know that there’s a high school northwest of the station, but that’s about the extent of my knowledge of that area. So I couldn’t help her as much as I usually can, since she didn’t know where she was very well, and neither did I. Somehow, she ended up at Dunn Loring station, and told me as much. My response: “Good. Stay there.” After all, she managed to get to an Orange Line station, and so all was well. None of us quite know how she managed to get to Dunn Loring, though, since I would have expected, if she was going to land at a different Metro, to end up at West Falls Church, which is also very close to I-66 and easily accessed from there. Dunn Loring, not so much. I don’t even know how to get to Dunn Loring by car. Only time I’d ever been to Dunn Loring before is for railfanning, since I think station visits are just as important as riding in the first car. Two demonstrations in three days? Yeah, I’m going to two demonstrations in about three days’ time, which is something unusual for me. Usually things aren’t spaced so closely, but this is what happens sometimes. Thursday is the sixth anniversary of the start of the Iraq War, and that day will be full of activism in DC for it. I’m planning to attend another Funk the War demonstration with DC SDS, and hopefully, unlike last year, all my equipment will come out intact this time. The Canon didn’t get to come out for the Anon raid last weekend, so Funk the War will be its first protest, provided the weather cooperates. According to AccuWeather, it will be in the mid-50s, and raining on and off throughout the day. Thus it might be Duckie’s time to shine again, but hopefully I’ll get to see how the Canon does in the bouncy conditions of a protest. Duckie, meanwhile, is a known quantity at protests, and does quite well in the daytime, as it was pressed into service, by necessity, as the primary camera for the NSM Counter-Protest last April. Then on Saturday, March 21, there will be another march on the Pentagon, sponsored by ANSWER Coalition. This hopefully will not be a repeat of the March on the Pentagon from two years ago, but we shall see, I suppose. Recall that I described the previous Pentagon march as a poor idea, since it was in not-very-visible locations, and the final rally was in the Pentagon’s somewhat-isolated north parking lot – in front of an office building that would be mostly empty on the weekend. Of course, what a difference two years makes otherwise, though – last time, I had received numerous threatening messages from right-wing wackos just ahead of the event, and this time, I seem to have slipped in under the conservative radar. And when you consider that the de facto leader of the Republican party is Rush Limbaugh, of all people, they have more pressing matters to worry about than threatening activists. And with the right-wing wackos safely back on their medicine, AccuWeather indicates that it will be sunny and again in the mid-50s on Saturday. Excellent! I think I might just do this whenever it rains. Just to recap, since it was raining hard when I was leaving the house, this morning, I wore my Crocs on my commute, and packed my dress shoes and dark socks in a grocery bag inside of my regular work bag. As expected, the Crocs got soaked, with a considerable amount of water streaming across Georgia Avenue in the morning. But who cares? They’re made of rubber. Then when I got to work, I made coffee, sat down, and put on my socks and my dress shoes. And the professional is ready to start working, and is all warm and toasty. No cold, wet shoes all day for me. That would have made for an awful day. Then when I leave, if it’s still raining, I’ll switch back to the Crocs for the Infoshop walk (it is Tuesday, after all) and then the Metro ride home. I think today will mark the first time I’ll have had to wait for the bus in the morning in the rain. It’s raining this morning, and so this will be an interesting experience. I think I’m also going to take a cue from some of my female Metro companions today as far as footwear goes. Some of them will make their commute in sneakers and then change shoes once they get to work. I’m thinking that with this weather, I’m going to commute in my Crocs, which I don’t care about getting wet, and then switch to my nice shoes once I get to work. The thought of spending all day in wet, nasty shoes is a bit beyond my tolerance threshold. I realized recently that I’ve gotten a little bit of a backlog of stuff I’ve been meaning to show you that I’ve captured with my cell phone over the last week or so. So here we go. 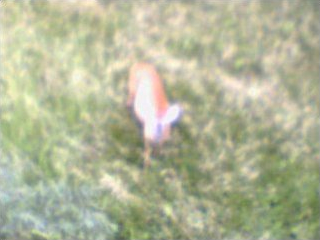 So there you go – photographic proof that deer do wander through the vacant lot next door. Apologies for the blurry picture, but this is the cell phone, and not Big Mavica. Well, my new computer has arrived! So how is it, you ask? I don’t know. I haven’t opened it yet. It’s very much still in the box. I’m writing to you tonight on the Gateway. The Dell showed up a little sooner than I expected, and I wasn’t finished moving out of the old computer yet. So I’m still on the old computer. I bought a transfer link cable for $20 after work, but then I realized on the way home that I can use our wireless network to bat files around between computers. Dad’s computer is going to be the temporary home for all of my stuff. Also, when you consider that I just dropped a big chunk of change on two computers (the laptop is still in transit), the cable is going back to the store unopened and I’m getting my money back. It still hasn’t quite dawned on me yet that it’s really the end of the road for the Gateway. It hasn’t sunk in yet. Of course, it didn’t truly sink in that the Previa was going away until I spent the time cleaning it out a couple of hours before it started the trip from which it would not return. Once I finish moving all my stuff onto Dad’s computer, though, it will finally be time to truly retire that old Gateway. I will shut Windows down for the last time. I will reboot off a floppy, destroy my old partitions, and reformat the hard drive. I will then power down, and start disconnecting cables. Everything will be disconnected, and removed from my desk. And then when we arrive at the bottom, meaning that the desk is completely bare, I’m going to start setting new stuff up. The new computer will go into place, and then my present monitors and speakers will return, my current keyboard and mouse will return, and then we’ll fire the beast up and bring it to life! And the change is made! It’s September 23, the first official day of fall. And that means only one thing: Long sleeves and the Chuck Taylors come back out for their own season. And I’m so glad about it, too. It seems to be a little known fact that I actually dislike short sleeves. I don’t know why, but I just do. I’d wear long sleeves all year (regardless of whether I wear shorts or not), but the weather just won’t permit it during some of the warmer months. But now, with temperatures dipping to fall-like levels, I welcome the change back. And my preference for long sleeves shows in how I schedule the change, too. Last time, I changed over to long on September 24 (coinciding with a very large protest that day), and changed over to short on April 24 – that’s seven months long, and five months short. Then this year, it was slightly less than five months on short sleeves. So there you go. Weirder is to decommission the Crocs and other summer footwear that I’ve been wearing for the last several months. I’ll probably replace the sandals (being pretty cheap as it is), and the Crocs will probably return next year. At work, every Friday is blue jean day. Pay a dollar to Children’s Miracle Network, and wear blue jeans that day. For the past two years, I have shunned blue jean day every single Friday. I’d never worn blue jeans to work, and saved my dollar each week. I did this primarily because I didn’t have any blue jeans that fit right. However, now that I’ve lost some weight (the same weight loss that lead to the April 26 wardrobe malfunction), I gave an old pair of blue jeans a try. Much to my surprise, they fit, and fit quite well. This pair of jeans was one that was in good condition from a long time ago. I bought these jeans on August 19, 1999, on a trip to Pentagon City and Potomac Mills with my friend Andrea Fox. I was 18. This was the week before I’d started my freshman year of college. In other words, this was clothing bought before the so-called “freshman 15” came on. So I am doing quite well, thank you. And I have room to maneuver in these pants, too. So I am just awesome. So where were we going with this? Oh, yes. So I wore the jeans. Add my tie-dye shirt to that mix, which is a few different shades of blue. Then add to that a pair of backless Faded Glory sandals with tan leather straps. And no socks. All in all, I felt rather dressed down today at work. 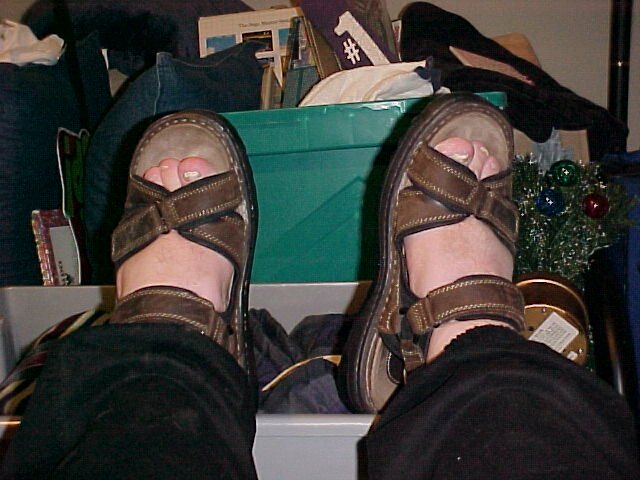 After receiving an anonymous message through my Instant Messenger that sandals with socks were a major fashion no-no (even though Sis has told me that for years), I finally kind of had one of those what-the-hell moments. So I left the socks at home. You may recall I did this once before – last year. I wrote about it in the Journal at that time. The funny reaction I got was when I realized that sandals without socks is basically like going commando for your feet. No socks is like going without underwear, after all. A coworker overheard and said, “You did not just say what I think you just said!” I repeated myself, and they admitted then that they didn’t hear the word “feet”. Also, a few unrelated things… first of all, the construction site where they’ve been rebuilding Route 608 in Stuarts Draft is now what I would describe as “drivable with extreme care”. The road is technically closed to traffic, but VDOT can’t fully block it off due to houses, a farm, and a business along that stretch of road that still have to have access to the outside world. So I drove it today as a little side trip. The road is definitely straighter and higher than it was before, and it will have curbs and storm drains, which the road previously lacked. Supposedly, it’s to be complete in August (moved up from the original October completion date), but I’ll believe that when I see it. It will certainly be nice going the regular way again, rather than taking this lengthy detour through a somewhat windy road, where people have a tendency to drive too fast. And on a second unrelated note, I went to Charlottesville yesterday, by way of Crozet. They’re filming parts of Evan Almighty in Crozet, where they’ve built a giant ark for the movie. I took some pictures of it with my cell phone, and I’ll show you those once I get them all downloaded. Whoever thought dry skin would be so debilitating? After my day on Thursday running around in flip-flops, my feet were VERY dry. I presume, since I was in the heat for much of the day that it was caused mostly due to perspiration evaporating off of my feet. This didn’t happen when I did that Hagerstown/Martinsburg/Winchester trip, though. Still, Friday morning when it was time to go to work, I realized that my feet were so dry that they’d cracked, and that the left foot was so much so that it was painful. So much so, in fact, that I was actually walking with a noticeable limp at work on Friday. Needless to say, I broke out my “Extra Strength” lotion in an effort to improve the conditions. It seems to have improved things some, as I was walking with less of a limp on Saturday, but it was still noticeable, and I was moving really slowly. Then Sunday, I was walking normally again, thank goodness. So now I’m concerned. I go to the beach in a little more than a week (I leave August 23), and I’m so hoping that I don’t have a repeat of this at the beach, since this could so put a damper on the excitement like that. Speaking of my vacation, though, it’s funny… with my vacation falling during the first week of school around here, I don’t know when I’ve ever been so excited for school to start. Selling the back-to-school crap at work makes me even more excited, since every notebook scanned is like one step closer to the beach. I’m sure those coworkers who are still in school just love me for it, too, since I’m not ashamed to admit that I’ll be lounging on the beach during the first week of school. They saw it, and that’s all that they shall see of it. Sometimes, you just have to give people what they want. At work, coworkers comment all the time about my wearing my sandals with socks. That’s just how I do it. I wear the socks with the sandals because, for some reason, sandals without socks cause the shoes to smell absolutely awful. Plus the socks help wick sweat off my feet. So it works out.